Welcome to Chef Dana Klitzberg, the new East region chef for Monogram. She will be leading cooking demonstrations at a variety of events with the Monogram team across the region. Recently designer engagement leader Susan Cozzi interviewed Chef Dana to learn more about her background and cooking philosophy. SRFD: Tell us about your background as a chef. Chef Dana: I never set out to be a chef! After graduating from the University of Virginia, I came straight to NYC to work in public relations, in fashion, lifestyle and entertainment. After years of event planning, working with restaurants and caterers, and food and beverage clients, I got the itch to work in the food sphere. As a literature major, I’d always loved writing, and the food media world was just beginning to evolve: this was before digital media, the Food Network was brand new, and magazines like Gourmet and Food & Wine captured my imagination. I decided to quit my PR career and go to culinary school in NYC, to then join a food media organization armed with a basic culinary knowledge. But when my professors nudged me in the direction of completing my mandatory externship at a restaurant instead of a food media company, I acquiesced. I worked at one of the top Italian restaurants in Manhattan, San Domenico NY, where I was literally the only non-Italian in front or back of house when I started there. It was so completely different from working in an office environment, and I loved the atmosphere, the teamwork, the creativity, and also the intensity. I was a ballerina for most of my life, and the intensity and technique paired with artistry in dance and performance are also at play in the professional kitchen, and this really resonated with me. So, I was hired out of my externship and stayed at San Domenico for a year before heading over to Rome for further restaurant training. What was supposed to be a four month stint turned into eight years! You could say I fell in love with my Roman life. Professionally, it was often a struggle, because being female and American in the Italian professional kitchen are two strikes against me, going in. But in time I won over my colleagues and executive chefs. And I was eventually hired as executive chef at two different restaurants in Rome (a first in Italy!). I created, along with close friends of mine, the first American brunch in Rome — a “pop-up” before the term was even coined. Now I cater and provide private chef services, teach cooking classes and lead culinary tours (I was the first person in Rome to do this in English), and I write about food and restaurants for various publications, including Fodor’s guides and Time Out guides. I also consult for restaurants, and occasionally I style food for photo shoots. I have a food blog and I’m also working on a memoir with recipes. I love the many facets of the food industry, and by wearing several different hats, I don’t get bored and I don’t experience burnout. I learn through travel, through reading, through meeting other food people. And there’s always, ALWAYS something new to learn! SRFD: What is your cooking philosophy, other than “using the freshest ingredients”? Chef Dana: My background in Italian and Mediterranean cuisine means that “farm-to-table” was never a trend because it’s always the way things have been done. So yes, starting with high quality, seasonal ingredients is pretty much a given with me. I love to cook food with history, and with meaning for people (myself or my clients — or both). Food is nostalgia, and it’s the future. It is culture, it’s art, it’s entertainment. It can have a sense of humor. It is mood-altering, and I like it to be uplifting and comforting at times. On the whole, quite simply, I like to cook what I like to eat. This is not terribly limiting, of course, as I have a varied palate and I like most things. But I particularly like food from sunny places, whether that means equatorial areas like Southeast Asia, Africa, Brazil and the Caribbean, or the Middle East and the Mediterranean, two areas that feel like home to me. I honor regional traditions and follow the ethos of “what grows together goes together.” Everything you can make from scratch, within reason, is better made than purchased. And I also believe that you get out of food what you put in, so I try to cook when I am happy, interested and “in the zone.” It may sound silly, but I believe it truly makes a difference in one’s cooking! SRFD: What’s always in your fridge at home? Chef Dana: I have a fridge full of condiments, both homemade and purchased, many of which are a little esoteric and/or international: tamarind paste, guava jelly, fig mostarda, kimchi, ‘nduja sausage from Calabria, squid ink, preserved lemons, kumquat simple syrup. I always have some homemade dressings and sauces (a good pesto, for instance). Then staples like eggs, butter, parmigiano cheese, lemons, lettuce/greens, bottled water, and a crisp white wine. And dark chocolate in some form, always! SRFD: What makes you happy? Chef Dana: I’m an October baby, so I love a gorgeous fall day and a stroll, a great museum, musical theater, or the ballet (I danced for 25 years). I am also a water person, in a big way, so beaches and coastlines make me happy, as does being out on the water or in the water … or eating and drinking next to the water. Great food and conversation with friends and family can never be overestimated. I adore the Mediterranean idea of a long, lingering, multi-course dinner with different drinks at every course, then digestivi. Italians have mastered this art. I’ve also always been a huge fan of comedy, so heading to a stand-up club or improv show makes my day a good one. SRFD: What do you see in the cooking world that you wish you could change? Chef Dana: I’m an unabashed feminist — not the ’70s bra burning variety, but I was raised surrounded by men and a strong father figure, and my Mom always taught me that women could do anything men could do. So, I’ve always been an advocate of women in traditionally male roles. The kitchen is one of those male-heavy places, and it can be an incredibly sexist and competitive work environment. I’ve enjoyed knocking down barriers and far surpassing expectation, and winning the guys over by honing and then demonstrating my skills in the kitchen, by killing them with kindness and taking things in stride, and sometimes, when needed, by giving them a taste of their own medicine, whether that’s a display of machismo or being able to take some serious ribbing and giving it back to them! I must also say that I am encouraged by the huge boom in the interest of careers in cooking, but am disappointed at those in this young generation who expect to become “celebrity chefs” (whatever THAT means!) or restaurant executive chefs and owners after working for 18 months or two years out of culinary school. The food industry is certainly intense and physically demanding, so youthfulness helps in that sense. But you also need experience more than anything else. Ask any great chef, like an Eric Ripert, and they will tell you: you need to put in the time. Peel potatoes and butcher fish for a couple of years, and keep your eyes and ears open around you. Don’t expect that the world should be yours so soon. Everybody needs to do the grunt work in the beginning. 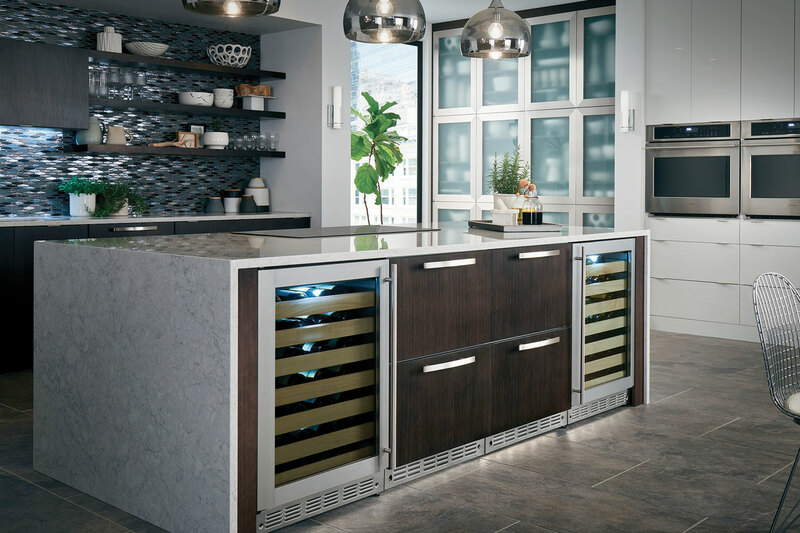 SRFD: What have you learned from working with Monogram appliances? Chef Dana: I’ve learned that technology and innovation can be applied across various categories to improve very different items. For instance, Monogram applies technology gleaned from its aeronautics division: the ball bearings used on airplanes are built to resist high heat, so Monogram uses them for its rolling oven racks so the racks can remain inside when the oven is in self-cleaning mode. GE invented the halogen bulb, and Monogram implements this technology as part of its speed cooking feature in the Advantium oven. These are just a couple of examples of the thoughtfulness that goes into the creation of Monogram products. I’ve also become much more aware about the particulars of any equipment on which I work. As a chef I’m always looking to improve, innovate, refine — and understanding one’s equipment is essential to this growth. SRFD: What can home cooks learn from you? Chef Dana: I have lots of experience cooking in high-pressure situations in restaurant kitchens, and many of those kitchens were filled with assistant chefs and dishwashers and servers who did not speak my mother tongue. I also have vast experience catering in the strangest of locations, under very odd circumstances. But now, I most frequently cater and cook as a private chef in clients’ homes, and so I’m well aware of the necessity of adapting my cooking and my recipes to the home cook, to the realistic kitchen, not just the restaurant kitchen. Home cooks can learn from my adaptability and flexibility, which will make their work in the kitchen feel a lot less like work. Also, many home cooks don’t realize that half the battle of cooking for family every night, for home entertaining, and for keeping a pantry and fridge that will keep the whole family happy and healthy, is planning. PLANNING. I’ve cooked for 300 people in a kitchen smaller than most Americans’ laundry rooms — it just required planning and organization. Once this is taken care of, the cooking part is just fun! We had a great time at the Monogram Designer Summit in February with all of the designers and participants. As a follow-up, we interviewed some of the designers to learn a little more about their background and design experiences. Today we’re featuring Alberto Villalobos with Villalobos Desio based in New York City. Alberto: I became interested in interior design from an early age. From building tree houses to playing with Legos, I always had an interest in creating spaces and playing with proportions that led me to interior design down the road. Alberto: My business partner Mercedes and I enjoyed working on our latest project in London. It was a great experience to work there with new contractors and getting out of our comfort zone in the States, by meeting new vendors. The client was really easy to work with which added to the experience, plus shopping in Europe is always fun. Alberto: I am over finishes that are not true to nature. My business partner and I prefer natural materials that are real, we appreciate craftsmanship and details. For example, when we use ceramic, we like ceramic that is true in nature, not one that reproduces another element such as wood. Alberto: We are excited about the rediscovery of terra-cotta. Again, it is a natural material that is noble and relates both to our Latin and European backgrounds. SRFD: What did you learn during the Monogram Designer Summit in Louisville? Alberto: My favorite take-away from the summit is that knowledge is not understanding, a very interesting principle. It has helped me to see things differently and makes you realize to always question yourself. What a great tool for the design practice. We had a great time at the Monogram Designer Summit in February with all of the designers and participants. As a follow-up, we interviewed some of the designers to learn a little more about their background and design experiences. Today we’re featuring Patricia Davis Brown with Patricia Davis Brown Designs LLC based in Vero Beach, Florida. Patricia: I think I was born a creative and I would have found my way to the arts one way or another. As a kid, I remember riding in the backseat of my parent’s car looking at the buildings as we drove past. To entertain myself, I would pick a really worn looking place and imagine how I could make it beautiful. I think you are born a creative, it is in your DNA. Even though I am educated in design and hold a license in interior design and certified in kitchen and bath design, I believe the talent is within, education or not. Patricia: I like a challenge and to me, that is remodeling an old property into a great design. I am currently working on a project located on the intercoastal waterway. The view is amazing, but the original property was a designed poorly and really had never had the design thought out. I believe that they just had maxed the property lines with a building and it was oddly shaped and needed help. I am pretty sure there was no architect involved with the original design, the home had no distinct architectural direction. Properties like this need to be eclectic and the personality have to be designed into it. My style for this project is industrial contemporary. I am bringing in a balance of textures and letting the beautiful views beyond the windows play an important roll in the design. The main floors are concrete and the ceilings are open beamed with a painted rub through finish. I am maximizing all the windows to increase the views into the space. Patricia: Carrara marble has been done and I think it is time for another countertop material to shine. I have never been one for trends. There are lots of material options out there and I think a designer that thinks outside the box is able to set the trends. Let’s just take marble tops as an example. A designer should expand their library of materials in countertop to include some amazing finishes that they can bring to their clients like, glass and lava stone. I love mixing countertops materials in a kitchen to create shapes and artistic details. Patricia: I am digging the use of metals in interior design. There are so many metal finishes to choose from, rose gold, brass, black, etc. and it gives designers the tools to create an original design for each and every client. I also, like the large groupings of chandeliers that are being used over islands and dining tables. White walls are trending now and I love how it sets up a blank canvas for popping art and other points of interest in a room. Thanks to an impressive team effort, a refreshed and rebuilt Monogram website launched yesterday! The updates include a full responsive redesign of over 5,000 pages across the site, supported by extensive usability testing and dozens of interviews conducted in an effort to better understand the target audience. Recognizing the growing trend of browsing on mobile devices, the fully responsive site will allow designers to easily access specs and other key information from anywhere. We have also added a new trade professional page with easy links to critical resources. Please take a look at the new site and let us know what you think!